Get the free Certify Mobile application for iPhone, iPad, Android, Windows Phone, and BlackBerry. Certify Mobile enhances your Certify subscription by providing access to your Certify Wallet while you are on the go. 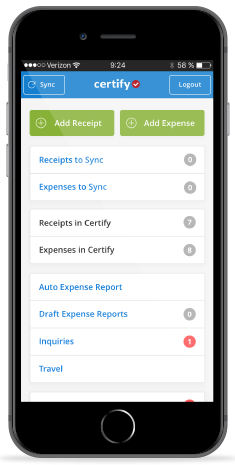 Get the free application on your phone and start capturing receipts and expenses as they happen. Your physical wallet will become thin again, and your expense reporting workflow will be changed forever! The Certify Mobile app is available for free in app stores on all supported platforms. To easily locate Certify Mobile in your device's app store, you can enter a USA mobile phone number below, select which platform you want, and click Send Link. A link to Certify Mobile in the selected app store will be sent to your phone by text message. If you want to use the legacy version called Certify Wallet, select the desired choice from the drop-down list.